The silver DAC3-L from Benchmark is a two-channel reference preamplifier with a built-in digital to analog converter system. It is capable of converting Direct Stream Digital (DSD) signals as well as Pulse Code Modulation (PCM) files up to 24-bit / 192 kHz. 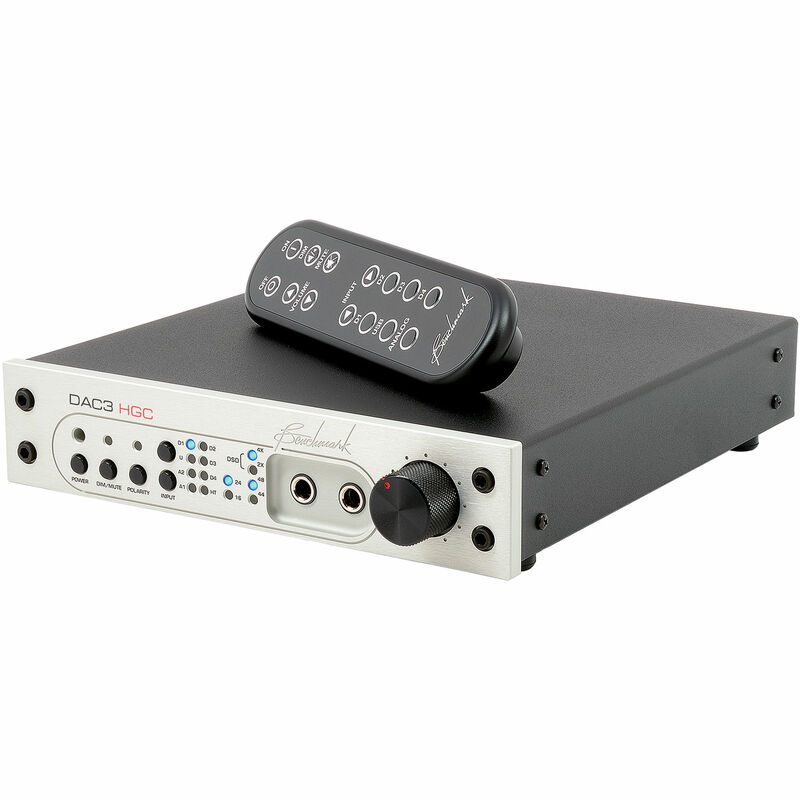 Designed as an output device for computer-based media, the DAC3-L can be used with home media servers, digital audio workstations, desktop audio editing applications, and computer-based radio broadcast systems. The DAC3-L maintains the familiar DAC2 form factor and feature set, but delivers the higher performance available from the ES9028PRO D/A converter chip. The 8-channel/32-bit ESS Technologies ES9028PRO chip features two distortion compensation systems, which independently remove most of the 2nd and 3rd harmonic distortion in the D/A converter. It also uses 4:1 summing to form each of the two output channels. This results in an enhanced frequency response and a 6 dB signal to noise improvement with low THD and THD+N noise. The DAC3-L follows sample-rate changes initiated by your computer or software and uses a multimode asynchronous USB system for data transfer. This allows the unit to act as the clock master, reducing jitter by first transferring the audio data from your computer to an internal buffer, and then to the digital to analog subsystem. The dual data transfer uses Benchmark's proprietary UltraLock3 jitter attenuation system, reducing jitter noise and distortion to at least 140 dB below the level of the audio. The Hybrid Gain Control (HGC) combines the unit's active analog gain control, passive low-impedance attenuators, 32-bit digital gain control, and servo-driven volume control. The HGC provides the dynamic range of an analog system and the accuracy of digital control. All analog inputs are controlled in the analog system and digital inputs in the digital system. The 32-bit Digital Signal Processing (DSP) also provides up to 3.5 dBFS excess digital headroom throughout the entire conversion process. The DAC3-L features a variety of input and output options including two stereo unbalanced analog RCA inputs, two optical TOSLINK digital inputs, two coaxial digital inputs, one USB digital input, two stereo analog unbalanced RCA outputs, and one stereo analog balanced XLR output. It is compatible with the Benchmark IR remote control (included).